You know, you really can go home again. I just did. On the trip back from vacation, instead of sitting bumper-to-bumper in Chicago traffic, we swung to the west and visited my old stomping grounds: the neighborhood where I lived from ages one to eight. Now that seems like a short span, but it was such a pivotal time. That early childhood experience has influenced much of my life, including my dreams. I also recently toured my old house, school and downtown aerially on bing.com. It was weird, but kinda neat. I had no inkling that I would virtually be re-tracing those footsteps anytime soon. The opportunity just presented itself. Oh and what a delicious treat it was. First we went straight to my old house at 274 Forest, an address forever etched on my heart. It's a beautiful Dutch Colonial on a tree-lined street. not the barn red I knew, but taupe and twice the size. All of the primarily 1920s and 1930s houses have been enlarged and well tended. Funny thing is, they seemed so much closer together, but I'm probably at least twice as big as I was then. One neighbor I swore was two block away was, in reality, four houses to the south. And the school was a two-block walk as an adult. An eternal trek – especially at lunch time or after school scurrying to catch Dark Shadows – as a primary student. The house looks wonderful and it struck me that it feels like the house in which I currently live. My mother always said that, but I didn't believe it until being there again. Both houses even have funky little windows at the top of the stairs. We parked in front of the house and I tromped up and down the street, remembering which neighbor lived where ... some I had not thought of since we left in 1968. The visual aid really opened the memory gates. Names and faces surfaced that I had not recalled since I was eight. And, really, not much had changed physically. The house on the corner was home to a big brood called the Hersfelds. As a kid, it seemed like they lived in a castle with a wide L-shaped hall spacious enough to accommodate several bunk beds. Kind of like a big dorm. A really fun big dorm with lots of neighborhood pillow fights. It, somehow, seemed diminished in stature to my adult eyes ... until I smelled the peculiar musty musk of books. Only in front of this house. Likely what I would have sniffed it there as a kid. Interesting what smells can evoke, isn't it? It was a place of grand memories no matter the literal size. I relished plodding my old path to school. And the fact the old brick Main Street Elementary is now a very active rec center, carefully remodeled to be fully functional, yet preserving the fine old bones and woodwork. My kindergarten room is a preschool, my first-grade, a dance area and, best of all, my very favorite second grade class is the arts-and-crafts studio. Nothing could have made me happier. As I lurked around the side of the building to that bottom corner room, I relived the memory of a classmate with some disabilities who walked out into traffic and was hit. She survived with a broken leg, but it was the worst thing I had experienced in my young life. Yet it was also within this story that an adult Sunday School teacher told me at age three my heart was black with sin. That is something with which I have been struggling a long time. I intuitively knew it wasn't, but was not capable of saying so. It had not occurred to me, until now in processing my time travel, that so much more happened in those years than merely that. Maybe that's why I was called home ... to see the blessed community that shaped me so early in life ... much more so than a well-intentioned, but very wrong, adult. – our favorite babysitter's house. Although the drug store is now a restaurant, we stopped in for lunch and did, indeed, have green rivers and I was satiated on so many levels. I had returned home on my terms and it was heartwarming! • Is there a time/place to which I have returned that provided a different glimpse? • Is there somewhere I need to "travel?" • What places form childhood do my dreams take me? • How have I paid attention? Tomorrow my baby turns 10. It sounds significant, maybe even awful. What, precisely, though does it mean? She's no longer a baby? Is it about her, me or both of us? If I'm honest, it's really about me. How I've witnessed her growth, been there to hold her hand, scold her and let her go at times. How she has changed me, loved me, pushed me, crowded me, molded me and increased my capacity for love. It hasn't always been perfect, probably almost never. It has been sweet, bittersweet, maddening and I wouldn't trade it for the world. Well, catch me on an off day and I may respond differently. You see, she's my wild child. Just tonight we had to threaten her to pick the beans she promised to pick last night. Nothing is ever easy with her. She whined our entire vacation, reminiscent of when she was a toddler. I know transitions are hard for her and if they're hard for her, they're hard for us. Her bark is far worse than her bite and I have to remind myself of her age. She's fierce, feisty, persistent. And she's also my mirror. When I'm having a bad pain day, she has always been my medicine -- a private tonic only she and I share. She also knows pain is my Achilles' heel and can manipulate that. I haven't yet figured out what that means for me. That I should always rise above the pain? That I don't need the pain? I really am going to write a book someday soon titled Letting my Lily Out. I have to. To understand why each of us is in the other's life. But tomorrow, the anniversary of the ten years since she first arrived as a beautiful bouncy hairless infant, I will focus on the celebration of having her in my life ... warts and all. • Is there someone in my life who acts as a mirror for me? • What do each of us mirror for the other? • How can I navigate a somewhat rocky relationship to know my lessons and give the other what he/she needs from me? • What makes a mother-daughter relationship one of the most complicated? The most precious? • How can I be more present in the celebration of that relationship? I seem to be thrust into the lives of many 20-somethings lately in the midst of beginning to mourn my parents' looming mortality. Perhaps the perspective of my folks' health difficulties roots my observations of youth. And I am somewhere – exactly – between. A place of being present leads me to look at these young adults with new eyes ... pupils that see wisdom in their inexperience. View the inexperience as fresh, unfiltered and an extraordinary lesson for me. We're invited to a weekend gathering culminating in a Sunday fairy wedding outdoors on a carpet of rainbow petals and vows affirming the power of nature. And a reception where the 20-somethings only dance communally, continually inviting all into their vibrant circle. However, well before the wedding and reception came the get-acquainted picnic [simply and beautifully staged in a park shelter along the lake, lit with candles and strewn with gourmet goodies] and regular breakfasts at the inn with other wedding guests so that by Sunday, we really were family. There was such a sense of community that it felt like a village wedding with guests who, two days prior, had been complete strangers. I have never experienced that before. We were all really invested in this relationship, which is what drove the loving community that formed. One of my favorite wedding stories came from the groom's father the morning after. He said when the couple was dropped at their hotel, they had nothing save the bride's small purse and their wedding clothes. Not even a credit card to confirm their reservation. They fearlessly assumed their attire would admit them. What wonderfully innocent confidence. I used to have that and was reminded recently when that very phrase surfaced and resurfaced in my journal. It was always attached to the vigilant mother. The tense one on the lookout. I loved this example and embodiment of innocent confidence. I need a reminder model. During the course of the wedding visit, we squeaked in time with my daughters' favorite baby sitter, whom they claim as their older sister. She's the most beautiful, fun, loving and creative person I know. She recently graduated from college in drama and works as a nanny. I look at her and she just oozes talent, yet can't find work in her field and bestows her talents on four very lucky toddlers. She's furnished her apartment via the finest area thrift stores and it works: spired clocks, Eastlake dressers, green-and-gold plush chairs and couch ... castoffs that have creatively been assembled into a home. One she shares with another amazing 20-something also seeking her way. It reminds me of my life post college that, from this vantage, looks pretty tough. Yet I reveled in its freedom, simplicity, independence and responsibility. It's as if no one of another age existed in the world -- or at least no other perspective. The relish, enthusiasm, zest and joy was so evident, intoxicating and contagious in all of these 20-somethings. As Harry said while dining with Sally: "I'll have whatever they're (she's) having." • To whom do I look for wisdom? • What can I gain from those younger than myself? • What memory do they spark in me that needs to be rekindled? • What zest can I revive? • How can I be the right balance of a 20-something in an older-something body? Last weekend was my husband's and his twin sister's birthday, always spent together, and they agreed to celebrate at a local pheasant farm. We had eaten there years ago and I was "game." I had not anticipated the breadth of the feast, nor the event itself, something called dinner in the field, which included a hearty country meal (smoked pheasant and bruschetta appetizers, grilled pork and chicken, skinned mashed potatoes, giant kettle-cooked green beans, grilled corn on the cob, homemade bread and applesauce, crisp and light cole slaw, ice cream and fresh berries) and local farmers, including vintners and beer makers, with their products. 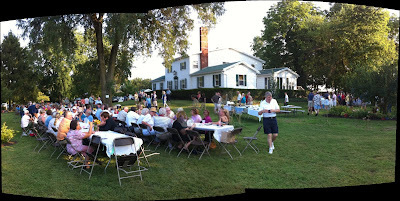 It was a celebration of agriculture and felt like the American equivalent of a Tuscan al fresco dinner. Long tables lined the apple orchard, where we sat communally savoring the multi-sensory experience of food, conversation, live music, acquainting with strangers and chatting with regional fruit, vegetable and animal growers. And reminded me of an article I clipped years ago from Saveur, a real foodie magazine, focused on an Italian town that annually blocked the main street, while residents prepared a spaghetti feast for the entire population. There was a wonderful glossy black-and-white photo of those long tables, dressed in linen and dishes, end to end. 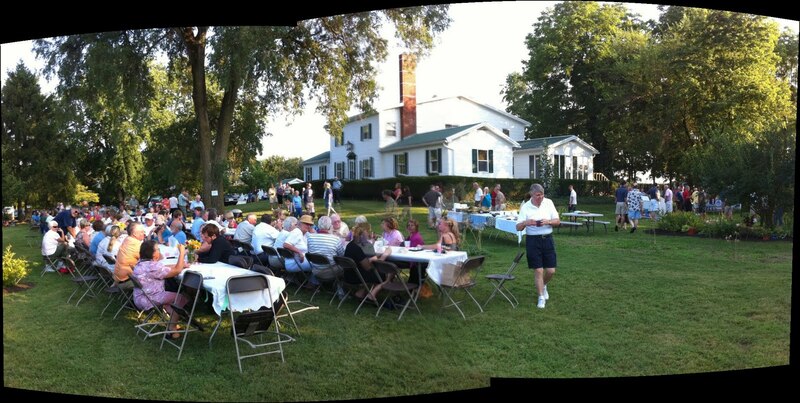 It gave me an idea to host such a meal in my hometown, Milford. Back then, I was involved with a terrific organization called Neighbor-to-Neighbor, initially created to bridge the 2001 Cincinnati race riots. I wanted this group to take it on as a "One Day Dinner" – kind of like a Sunday dinner, but with the emphasis of celebrating our alikeness, not our differences. It didn't fly, but the idea still hasn't left me. I like the idea of a community pitching in, organizing, cooking and eating together. There's such ritual and congregation that revolves around eating a communal meal. I LOVE food preparation. It's creative, cathartic, relaxing, energizing, sensual, artful and a bazillion other things. Imagine it magnified with more people involved. • How have I noticed food collecting people? • What opportunities are there to gather my community? • In what other ways could I be active in my community? • How is it important to me to support local businesses/farmers? • For what in my community am I grateful? What's it like to face mortality? I mean the nitty gritty. What does it feel like? How do you get yourself to a place of acceptance, maybe beyond? I observed my 17-year-old cat bounce back from what seemed like near death earlier this summer. And my parents have both been hospitalized in the past two weeks. My mother, who is in good health, it seems, said she's ready when the time arises. She visited her sister often several years ago as she accepted the end of physicality with such grace and faith. In that conversation with my mother, I identified that the hardest thing for me right now would be leaving my ungrown daughters. They are a strong pull. I suspect as we age, our perception and perspective of death shifts from What am I leaving? to What I am entering? I'm certain it helps if we have some life experience behind us to make that leap. In my early 20s, my best friend quickly weakened to cancer, although no one would admit or even talk about it. At his wake, two of us wept at the thought that no one did with him either. In my 30s, I worked in the funeral industry and became comfortable with what happens after death, how we honor our dead, employ ritual to get us through and encounter grief. I had a miscarriage during that time which personalized the grief and loss and opened a new place in me. I am ready to look at death in myself and for others very close to me and find a similar new place. Not a locale of fear, but rather one of taking the next step and beginning to let go of our tight grasp on life in favor of something that may be more freeing. Of course, that suggests embracing the unknown. Life is the known and probably the reason for clinging so violently to it. Even if life has been unfair, unkind and painful. Just what is in that unknown? Is anticipating death any different than exploring our own shadow – the areas the light fails to shine? When I have undertaken that dark jaunt inward, I have found it teeming with life. Life different from the external, but life nonetheless. And, as I uncover what's there, I realize I am also illuminating those places. Could transition from life to death be the same? What if we were unafraid of death, treating it like a natural phase? Practicing gratitude for the life we have lived, the people we have loved, the lessons we have learned and looking forward to the next adventure. Maybe shifting us out of bodily pain and turmoil into peacefulness. I don't intend this as a theological discussion, but a practical, natural one. I do know on several occasions, I have felt the love and presence of family and friends who have left this life ahead of me. Each time I perceived more love than I had prior to the presence. I never experienced fear. What can this suggest? That whatever lies in the afterlife is capable or greater love and travels back to those still here? Where is there any fear in that? • How has my experience of death shaped my view? • Can I initiate a conversation about my ideas or fears with someone I trust that could be helpful? • Have I had an experience that, when explored more fully, opens me to a newer concept of the transition from life? • To what do I most cling in life? • What's the message for growth in that? I feel like a coffee pot with something percolating deep inside. Something important, but very unhatched right now. It has to do with an alternative to money as currency. Ideas, conversations, reading, encounters, etc all keep pointing me in this direction. The direction of living more harmoniously and with equanimity. When I have felt safe enough to mention this, bartering always surfaces from others. But I imagine something very different, although I can't say what right now. Something that does not reward privilege or favor or rest in the hands of the few and powerful. A currency available to all that tilts the balance of power and influence to the outcast, downtrodden, uneducated, poor, sick, homeless, those in the middle and even those with wealth. I think of the game Life – or even Monopoly – I used to play as a kid. Each player began with the same amount of play money. Again, still money, but the field was leveled ... until you landed on go to jail, had to pay a fine or experienced a catastrophe. The rules did NOT encourage help from other players; you were on your own – win or lose. I read somewhat recently that our financial system, our economy, is based on a centuries-old method developed by kings to finance war. It is a system that promotes and prepares for war. No wonder it seems so very warped to me. The entire premise is power and fighting others into submission. What if the underlying principles were nurture, creativity and advancing each individual to reach their potential to enhance the society? Sounds like something mothers, women, would do. A system that rewards and encourages personal development in the context of contributing to the whole and not just oneself or immediate family. I confess to considering money an evil tool. The way in which it is rewarded is out of whack and steeped in privilege ... to the point that those immersed don't see the privilege and view it as just the way the world works. I am guilty of that thoughtless mindset. In creating a new system, I don't envision a bland drone-like existence of sameness. I see vitality, creativity, drive, vision. No state or government that dictates. In fact, I believe the impetus will have to emanate outside politics. A health coop in Ohio runs apart from insurance and the group pays the bills of members as they arise. Simple and virtually unheard of – people taking care of each other. 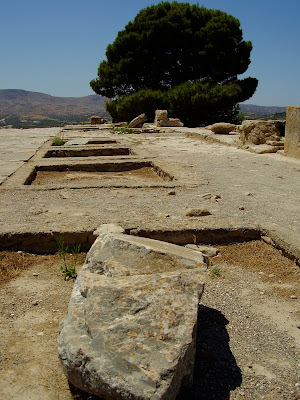 I am drawn to the little I've read about the goddess-/female-based Minoan culture in Crete. I once walked the corridors of the ancient palace in Phaestos and shivered with deja vu. As if I had been there when women ruled and arts, spirituality and reverence for nature flourished. And Sophia. What would the feminine wisdom have to say about who wins/owns our culture? What was Mother Teresa's currency? Love, compassion and care. What if we worshiped gratitude, abundance and sharing instead of envy, scarcity and hoarding? There are deep ramifications that would entail a complete societal re-haul that many will not embrace. But what can I do? Just me in my little ways to spread the currency of love? • How does money make me feel? • What's my life been like when I had less? More? • How often do I deal in the currency of love? • What are the rewards for myself? Others? • What single thing can I do to counter the violence money breeds? I recently reunited with pals – some of whom I haven’t seen in 20 years – from my newspapering days. It was a lovely lazy afternoon ripe with memories, personalities, shared hardships, witnessing how lives have been shaped and recast but, mostly, women connecting. With some people you immediately take up where you left off, getting deep quickly; probably because you have previously. With others, it requires some time to skim off the years, the insecurity, the bravado, the shyness, the reticence. But when you all arrive in that place, the experience is so rich. Everyone has a story to tell. Usually a tale of adversity that has made that woman grow stronger, braver and more loving. All in the group personally know the value of stories and storytelling. That was our craft. And yet it had been years since we had told stories together. There is a bonding in that sharing that requires trust, willingness and listening. Tweets, Facebook walls and texts are not sufficient to create real community. They may suffice as in-between filler for face-to-face meetings. E-mails are a better source of connecting, but nothing, in my mind, takes the place of a look-into-your-eyes kind of conversation. Safe community is in rare supply today. Genuine listening and feeling heard more so. That’s why we have to create spaces to do this for each other. So much artificial and fleeting stimulation in our world does not feed our souls in the manner a satisfying live conversation can. We must listen to these stories as validation for and of each other. In doing so, we nurture, encourage and affirm our True Selves or, as Quakers believe, that of God in everyone. Listening to stories does not have to be limited to established friends. Maybe it’s the bedraggled mother in the checkout, the moping pizza delivery boy or dazed elderly man. Often, all it takes is some expression of care couched in a simple comment such as: “Wow, you look like you’ve had a rough day,” “Late night?” “Can I help?” Don’t do it, however, if you’re not prepared to listen. True listening, emanating from the heart, is in rare supply simply because we have such little experience of using it as either listener or listenee. I learned what I call the golden rule of listening from a wise Quaker. “The burden of translation is on the listener,” she told me over ten years ago at a spiritual-nurture retreat. To me that means listening between, behind and around the words. Substituting words that may be uncomfortable with those that suit you. Listening, essentially, from the heart. It’s something that happens invisibly and unknowingly for the storyteller. But it can literally change the life of the listener. Try it yourself and find out. There’s nothing to lose by listening to another soul. Sharing and listening to our stories is transforming. • Am I more of a teller or listener? • What happens when I shift to the other? • What have I experienced when I have felt really listened to? • How can I hone my listening skills? • What can I do to create a safer community for such deep sharing?